Merry Christmas Eve from the team at Events by Melody! In heart of the season, we’d like to share with you our favorite winter weddings, and everything you need to know about planning one! We’ve all seen neutrals take over color schemes this past year, and winter weddings are no exception. Ivory and white paired with a natural green are the best base colors for this season. Add in some gold or silver accents and you’ll be good to go! The goal here is to pair clean, wintry colors with earthy tones to make everything pop. If you want to add more contrast, choose a deep accent color (think dark rose or sapphire blue) to incorporate into bouquets or centerpieces. The same color scheme applies to the cake. White frosted or naked cakes look very clean and elegant. Top it with a bold floral accent or gold trimmings and the whole thing will stand out. With the season's cold weather, it's important to make indoors warm and welcoming. Lighting is a big part of creating the right ambience, so bistro lights, lanterns, and candles will be perfect in the reception area. Winter is a great time to indulge in hearty, rich foods. For appetizers, think of baked brie tarts with jams and pear slices, or grilled cheese sliders with tomato soup shooters. Use mini mugs for soup so that guests can easily transport them. A hot chocolate bar is a staple at a winter wedding. Don’t forget the toppings like mint chocolate shavings and whipped cream! What’s the best part about winter wedding trends? Fashion! 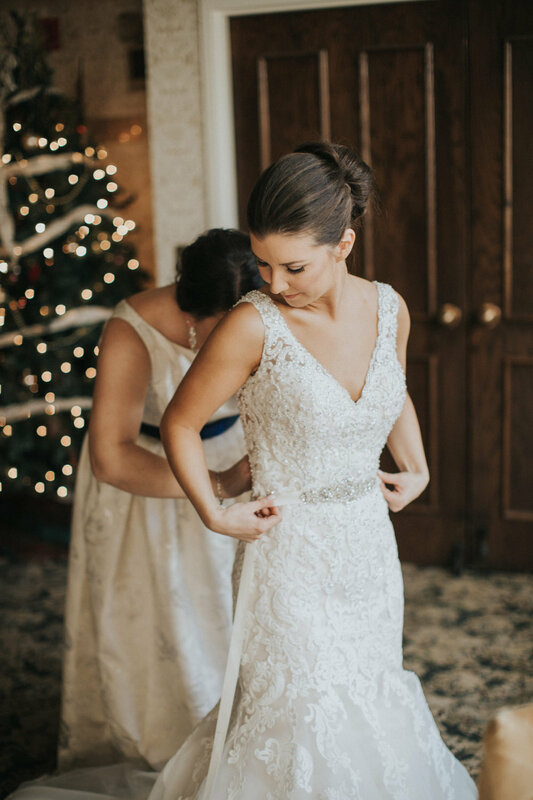 Bead and sequin accents on bridesmaid dresses will incorporate that sparkly snow look that looks perfect in any winter wedding. Fur wraps look great with any color dress, and come in handy in outdoor photos.